List Rules Vote up your favorite music parodies from "Late Night with Jimmy Fallon" and "The Tonight Show Starring Jimmy Fallon." Since his debut in 2009, Jimmy Fallon has made quite a name for himself in the world of late-night television. After taking over "Late Night" from Conan O'Brien, he introduced many popular, recurring sketches and comedy bits, but his music parodies and impressions have regularly gone viral and are some of the most popular clips in late night. This list of the best Jimmy Fallon music parodies has the funniest music clips from his late night career to date. When Fallon moved to Jay Leno's old spot as host of "The Tonight Show," his music parodies, thankfully, came along for the ride. Fallon is famous for his impressions of Neil Young and Bob Dylan, and he has also performed as Jim Morrison, Justin Bieber, Michael McDonald, and others. Celebrity guests often join Fallon in the musical sketches, with regulars such as Justin Timberlake and Bruce Springsteen. 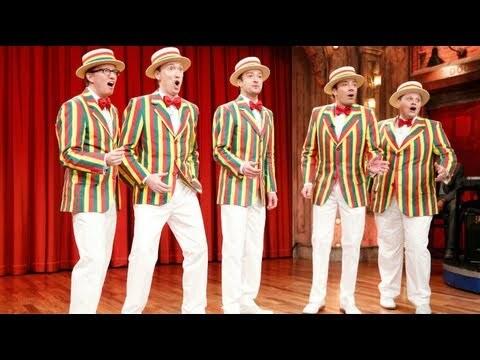 Fallon also collaborates with his house band, The Roots, and has two very special "bands" as well - The Rag Time Gals and a rotating group of chickens. Yes, chickens. Whether he's rewriting the words to classic songs or reenacting memorable music videos, Fallon is more than just a talking head behind the late night TV guest. The musical parody videos on this list span Jimmy Fallon's late-night career, from "The Tonight Show Starring Jimmy Fallon" and "Late Night with Jimmy Fallon." Vote up the best, funniest, most spot on Jimmy Fallon music parodies below and enjoy the TV host's versatile range of voices.